At the weekend Facebook's Mark Zuckerberg surprised the world by calling for more regulation, suggesting that the US should adopt Europe's data protection rules. But now the UK's information commissioner has asked him to take action to show he means what he says. 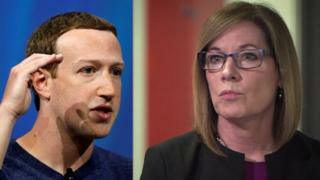 Elizabeth Denham has told Facebook to drop its appeal against the £500,000 ($655,000) fine she imposed following the Cambridge Analytica scandal. Last November Facebook announced that it was appealing against the record fine on the grounds that the regulator had found no evidence that UK users' data had been shared inappropriately with the political consultancy. On Monday the information commissioner said: "In light of Mark Zuckerberg's statements over the weekend about the need for increased regulation across four areas, including privacy, I expect Facebook to review their current appeal." Ms Denham had already come out fighting back in November, telling Parliament's International Grand Committee that Facebook had broken data protection law. She said the reasons it gave for the appeal were "disingenuous" and accused it of misrepresenting the regulator's rationale for issuing the fine. In his article in the Washington Post, Mr Zuckerberg called for governments to step in with regulation in four areas, including privacy and data portability. He suggested it would be good for the internet if more countries adopted GDPR, Europe's data protection regulation. And he said new privacy regulation in the US should "establish a way to hold companies such as Facebook accountable by imposing sanctions when we make mistakes". Now, having imposed just such a sanction, the UK's regulator has asked Mr Zuckerberg to show that his warm words about regulation are sincere. A source at the Information Commissioner's Office (ICO) said that if Facebook wanted to win back public trust this would be one necessary step. I asked Facebook whether, in the light of those remarks from Mr Zuckerberg and Ms Denham's comments, the appeal against the fine would now be dropped. A spokesman made it clear that was not going to happen, pointing to the reasons for the appeal given back in November. At that time, Facebook's lawyer Anna Benckert argued that the ICO's reasoning "challenges some of the basic principles of how people should be allowed to share information online, with implications which go far beyond just Facebook, which is why we have chosen to appeal". I wrote then that the last-minute decision by Facebook to launch its appeal was hugely risky at a time when it was trying to rebuild its reputation. Now the stakes have just got higher.